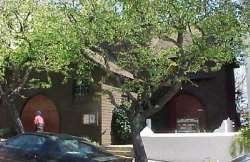 Holy Innocents' Episcopal Church is located at 455 Fair Oaks St. between 25th & 26th St. bordering Noe Valley and Mission Dolores. It is convenient to 24th St. Bart Station as well as various MUNI lines (J, 14, 14L). There is street parking on Fair Oaks and the surrounding streets. Click here for a map with more information about parking.